The ’90s have infiltrated our wardrobes consistently over the last couple of years. Whether in the form of stirrup pants or velvet slip dresses, these seemingly of-the-moment pieces are returning, adding the perfect dose of nostalgia that makes an outfit (in this author’s opinion) even cooler. This brings us to the subject of today’s post: the headscarf. 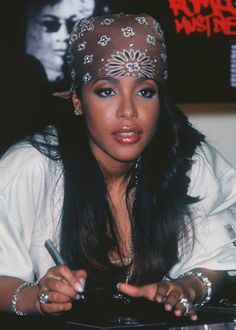 Though the look du jour when it comes to scarves has been to tie it around your neck, we’ve spotted a handful of extremely stylish women sporting these silky scarves atop their heads in a way that feels reminiscent of ’90s hip-hop stars—namely, Aaliyah. Re-create it with a classic paisley bandana, or channel your inner art student and try it with a colorful iteration—the choice is yours. See below for key examples, and shop our scarf picks along the way so you can test it out yourself. You can always count on Scott Schuman of The Sartorialist to spot the most current trends. Jenny Walton's take feels reminiscent of Grace Kelly. Try your headscarf with a T-shirt and vest for a relaxed, cool approach. We've always been keen on color blocking. Such a beautiful shade of lilac, no? Now that's a pop of color. You could wear this scarf with a T-shirt and jeans and still look amazing. Of course Tory Burch makes the perfect printed scarf. Want more ways to wear your scarf? Ask and you shall receive.